Anna Bogdanova Анна Богданова is this week’s track beauty! The Russian’s parents were world-class Olympic swimmers back in the day. Bogdanova, however, was frail and sickly as a child, according to an IAAF feature. Hence, she did not follow her parents’ footsteps towards pool glory. Moving to the Russian resort town of Sochi from frigid St. Petersburg proved pivotal, as the young Bogdanova was exposed to athletics for the first time. Despite displaying talent in the multi-events, the Russian became frustrated with the sport, failing to barge into the highly competitive national team. She came back to athletics months later, thanks to the proddings of her coach. 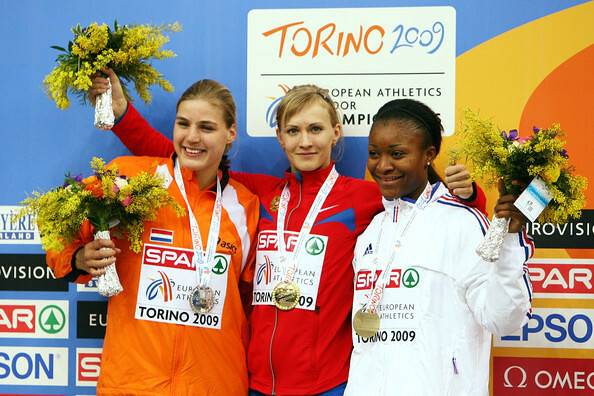 After placing 13th in her first ever international competition, the 2007 European Indoor Championships in Birmingham. Taking full advantage of her new found vigor, Bogdanova qualified to the Osaka World Championships the same year, finishing 10th in the heptathlon despite the humid conditions. 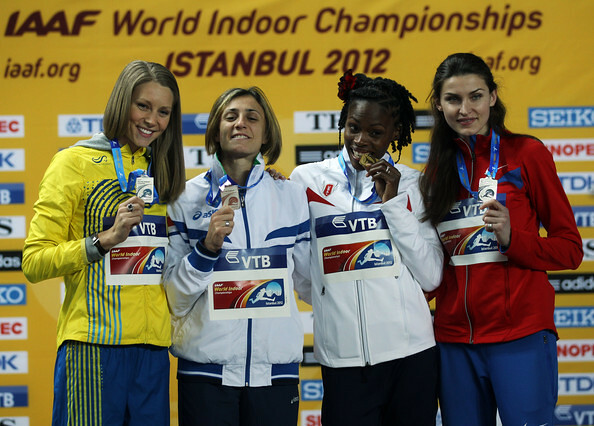 A year later at the World Indoor Championships in Valencia, Bogdanova won her first ever major international medal, a pentathlon bronze. At the Beijing Olympics the same year, the Russian scored a personal best of 6,465 points to rank a respectable sixth place. 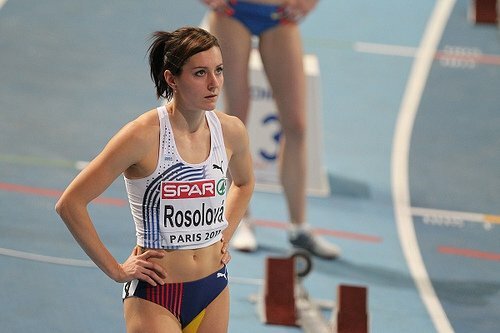 In 2009, Bogdanova wrested the European Indoor Pentathlon title. Ksenija Balta is this week’s track beauty! Reflecting the rich multi-events tradition of Estonia, Balta started as a fairly successful heptathlete. As a junior, she scored 5,747 points to clinch the bronze at the 2005 European Junior Championships in front her homecrowd in Kaunas. After 2006, however, Balta specialized in the long jump and the sprints. Soon enough, she reaped the benefits of specialization. The 25-year old leaped 6.87m to top a quality field at the 2009 European Indoor Championships in Torino. That same year, she reached the final of the Berlin World Championships. She was a favorite coming into the 2010 Doha World Indoor Championships, but faltered against quality competition, managing a modest fourth place (6.63m), losing on countback to Brazil’s Kellie Costa. 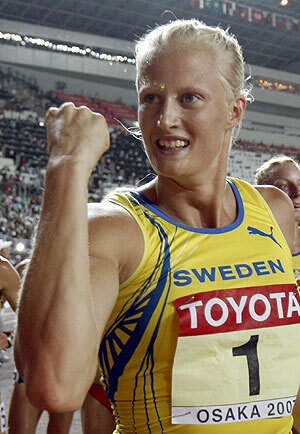 Balta, in light of her heptathlon background, also holds the Estonian 100m and 200m dash records, aside from her long jump national mark (as well as the corresponding indoor equivalent events). In fact, she attempted to double up in Barcelona, but pulled out in the 200m. The 25-year old finished a dismal 16th in long jump qualifying. A knee injury prior to last March’s European Indoor Championships in Paris sidelined the Estonian. Balta withdrew from the competition, unable to defend her Torino crown. 10-for-10: Tatiana Chernova talks about standing victorious on the podium, Queen and F.R.I.E.N.D.S! World-class heptathlete Tatiana Chernova Татьяна Сергеевна Чернова answers the 10-for-10 quiz! Chernova is amongst the elite in athletics, having won the bronze medal at the 2008 Beijing Olympics. She had much success as a junior and youth athlete, bagging titles at the 2006 World Junior Championships and at the 2005 World Youth Championships, respectively. Prior to her breakout performance at the Beijing Olympics, Chernova notched a new personal best of 6,618 points. At the world-renowned Gotzis Hypo Meeting last month, an in-form Chernova scored 6,539 points – the second best tally in 2011 – as she finished behind reigning Olympic champion Jess Ennis. With ten months to go before the Daegu World Championships, Chernova is on-track in exorcising the ghosts of her injury-plagued campaign in Osaka four years ago. My dad always trained heptathletes, so I became involved in heptathlon when I was a child. At first I took part in four event competitions. 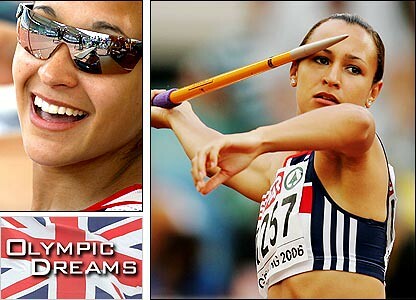 And when I [grew] up, started to do heptathlon! I won my first competitions, and next year win with the record World Youth Championship! So, [that] was [the] beginning. For me, every moment of my sports life brings happiness. Because when you win, and standing on the podium, listening the national anthem, then you understand the meaning of hard and long training, you feel the achievement of goals and Dreams! My dream is to realize myself and be happy. I prefer anything more shorter. I love the freedom of movement. Never heard of [Glee]. Hopefully I will be forgiven their fans. This [FRIENDS} is my favorite serial. Looked all seasons several time. 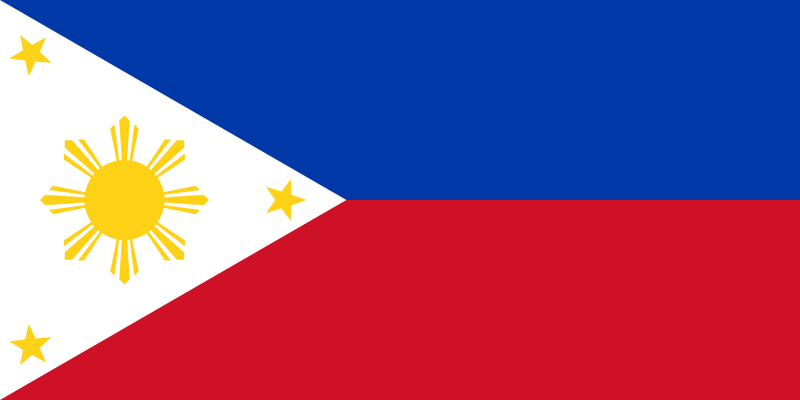 Most importantly – he is about common people, about the relations between them and their lives. Favorite serial always raises the spirits! I like Queen’s “We are the champions”! Every time I listen it, creeps running through the skin. I would [like to travel] around the world in a balloon! I don’t like to sit long in one place and do nothing. Remona Fransen is this week’s Track Beauty! The Dutch multi-event athlete had just won her first-ever major championship medal, a bronze at the 2011 European Championships in Paris. The tall Fransen tallied a total of 4,665 points in the Pentathlon en route to her 2nd-runner up finish. The 25-year old notched an impressive array of personal bests in the two-day competition. Fransen remarkably broke her best marks in all five disciplines. She even set a Dutch national record in the high jump, with her 1.92m leap (an unsurprising feat considering the fact that she’s built like the stereotypical high jumper!). Prior to her breakout 2011 season, Fransen’s best performance was a heptathlon gold at the European Cup Combined Events 1st League, second tier continental competition, where she set a personal best of 5,993 points in the heptathlon. With her surprise European Indoor bronze, Fransen’s confidence must be at an all-time high. Expect the talented Dutchwoman to contend for future continental titles – and to at least finish within the top echelons come the 2012 London Olympics. Check out heptathlon world record holder Carolina Klüft’s guts pose. Taken during the 2007 World Championships in Osaka. Take a look at the following Carolina Kluft interviews. The BBC interview was held right after Kluft won the 2003 Paris World Championships as a 20-year old heptathlete. The interview is in-depth and provides a uniquely intimate look on how Kluft thinks. Her answers are succinctly honest. The second clip is a more recent albeit less formal interview by Spikesmag. Kluft had just leaped a season’s best, earning a spot in the final despite her wild card entry to the 2010 European Championships. At first glance, the younger Kluft from 2003 might seem like an entirely different person. She was at the cusp of greatness, a world champion heptathlete at the tender age of 20. Fast forward seven years later. Kluft had retired from the multi-events, opting to focus on the long jump. She’s a far cry from her dominant self, failing to land within the top 3 during the Barcelona European Champs. Her body has also suffered from a string of injuries, the price of competing at the top level for so long. And yet, Kluft remained competitive. She still finds meaning in the sport, enjoying the competition and the challenge of a new event. Despite the difference in appearance and in events, it is apparent that the 2010 Kluft is as hungry and competitive as the 2003 Kluft! Indeed, Caro is every inch the champion.